Bokeh includes several layout options for arranging plots and widgets. They aim to make it quick to create your interactive data applications. At the heart of the layouts are three core objects Row, Column, and . While you can use these models directly, we recommend using the layout functions row(), column(), and . 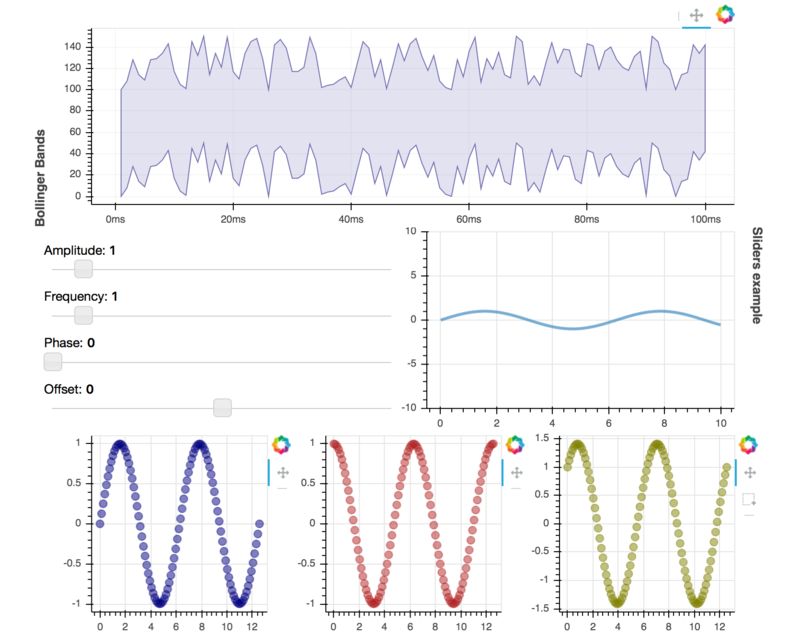 The layout functions let you build a grid of plots and widgets. You can nest as many rows, columns, and plots together as you’d like. In addition, Bokeh layouts support a number of “sizing modes”. These sizing modes allow plots and widgets to resize based on the browser window. All items must have the same sizing mode. Widgets should be inside a widget box. Every item in a layout must have the same sizing mode for the layout to behave as expected. It is for this reason that we recommend using the layout functions as they help ensure that all the children of the row or column have the same sizing mode. We hope to lift this restriction in future releases. Widgets are HTML objects like buttons, and dropdown menus. They behave slightly differently to plots and and putting them in a widgetbox is necessary so that they can all work together. In fact, if you try and put a Widget in Row or Column it will be automatically put into a WidgetBox. As a result, it’s a good idea to wrap your own widgets in a WidgetBox using as then you can be sure about how your widgets are getting arranged. For information about changing the position or orientation of plot toolbars, see Positioning the Toolbar section in the Configuring Plot Tools chapter of the User’s Guide. To display plots horizontally, use the row() function. Layout a group of widgets with the function. The gridplot() function can be used to arrange Bokeh Plots in grid layout. gridplot() also collects all tools into a single toolbar, and the currently active tool is the same for all plots in the grid. It is possible to leave “empty” spaces in the grid by passing None instead of a plot object. are equivalent. In addition, you can pass in plot_width and plot_height arguments, and this will set the size of all your plots. By default, gridplot will merge all tools within each child plot to a single toolbar attached to the grid. To disable this behavior, you can set the option merge_tools to False. You cannot use None with the ncols argument. It must only be a list of Plot objects at once. The full code for this plot is available at examples/howto/layouts/dashboard.py in the project GitHub repository.